I love great customer service! They accidentally brought out a chicken dish instead of the delicious Yaki Niku dish I ordered. The staff quickly fixed my order and brought out extra dishes on the house! I wasn't upset or mad.. everyone makes mistakes once in a while but this caught me off guard. Such a blessing! The food was really delicious and definitely much more quality quality than your usual japanese restaurant. We both came in for lunch and ordered bento boxes. He got the pork Katsu and liked that it wasn't drowned in gravy/sauce. The seared salmon roll sample they comped us with was a mouthful of flavors! I also liked the freshness of my veggies and the light ginger dressing. Great sushi with excellent service. The fish was fresh and well priced. Will visit this place again. It's tradition for my father and me to go out and eat sushi for us to bond. I've been to many sushi restaurants in my life with him, and we both agree that this place beats them all. In fact, he swears this place is better than the sushi he's eaten in Japan! Let me tell how much we loved this place: I've been a regular customer for 10 years (wow I didn't realize it's been that long!). The owner is so nice and he treats his customers well. He always greets us personally when he's there. His wife is so kind as well! The staff is sweet and the sushi chefs are brilliant. 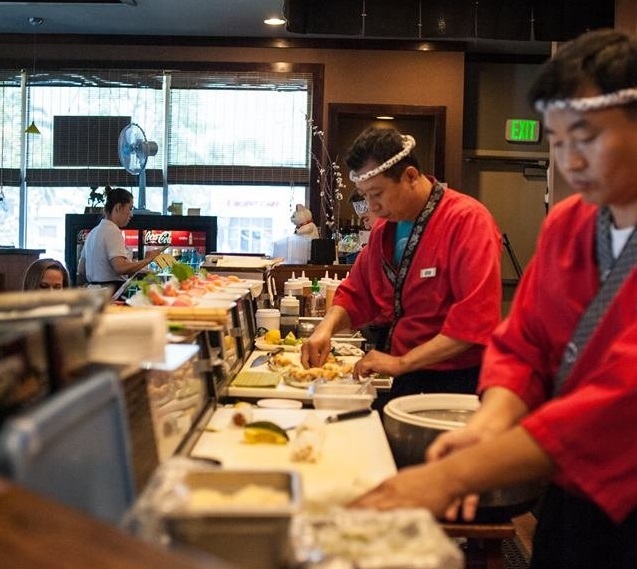 The best thing to do is to sit at the sushi bar and let the chefs pick the freshest fish for you that day. Never once has that let me down! Ten years ago, the rest of my family would rarely eat sushi, and order teriyaki or gyoza. Slowly over the years, they've come to love the sushi there just as much as we do! It's just that good! They are more expensive than some places, but the food is worth it. Their lunch special is a great deal! Sometimes I want to order one nigiri too of something fresh but I'm just too darn full! I definitely recommend it here. It's delicious, the people are great, and it's just a fun time for everyone! おいしい! My husband, little girl and I came here when we visited CA last week! One of the best Japanese restaurants we've been to and we've been to quite a bit! The sushi is so fresh and the food is delicious! The staff is so friendly and very welcoming! The servers kept coming over and playing with our daughter! They're so nice and the restaurant is very clean! Wish we had this restaurant in Chicago, but we will definitely be back when we visit! Thanks for such a wonderful experience!!!! I like the authenticity of Dana kai compared to many of the fusion restaurants around. I am purely a sashimi water, and more of the exotic types are my preference. The uni is fresh and amazing, and the bluefin with uni sushi special is to die for. The prices are pretty high, but you get what you pay for. Read the reviews and had to give them a visit. Easy access, lots of parking and very nice interior. We thought the menu was excellent, serving size and presentation great. Our waitress was wonderful, explained menu choices, made friendly conversation as this was our first visit. Finally found the quality sushi we've been searching for! AC was not up to par this day but can't blame staff for that. We'll be back! I have been here now 3 times and I enjoy it! The atmosphere is relaxing and pleasant. Although the sushi is pricey it's a nice place to dine once in awhile. I can say sushi is my favorite food, meaning I have tried many sushi places and this place has great quality sushi! It's not the best I've tried but it is on the list of good sushi joints for sure! Incredible sushi the best ive had in southern california. The complete experience miso soup and all. I've enjoyed sushi for many years. So I've eaten at some of the best sushi houses in LA and Orange County. Last night Dana Kai became my all time favorite! From the staff, the menu, the decor, an awesome choice of sakes, and of course the fantastic sushi, sashimi, and rolls Dana Kai has it all! Don't waste your time or money going any where else. Great atmosphere with great food! My only qualm is the server was a bit weird. She asked us if we were ready to order and when we said yes, she said "ok I'll be right back". We maybe saw her 2 other times the rest of the night. Also the menu was a bit pricey and a bit difficult to understand. I ended up ordering the Dinner Combination Special with BBQ Ribs and Beef Teriyaki. It was literally finger-licking good. I was still hungry though and got the Tuna Roll. Also excellent. Would definitely go again. Stopped by this sushi place while on my way back from the beach and I was pleasantly surprised on how good the sushi was. Service here was great. They were fast and very attentive. I ordered a spicy salmon roll and one of their speciality rolls and they were both really well done. I definitely recommend this sushi joint if you live in the area or just passing by. I love this place .We go there really often with my family. They have always fresh and delicious sushi, very good green tea and good service. Pleasant find in Dana point!! Fresh and delicious! Ordered poke roll, it was spicy but good. And sashimi combination which was $22 and came with 12 pieces of very fresh fish! Came with 2 kids and they were happy too! This is my favorite sushi place in Orange County. Service is incredible, always can get a reservation, and the food is great! There is literally something for everyone on the menu. Even if you don't like raw fish, there is something there you will find which will work for you. Such a good place! We decided to give this restaurant another try and was extremely surprised how good the service we received compared to our last visit! They have won back our business! Dana Kai is hands down the best sushi restaurant I have ever been to. It's not cheap, but the fish is incredibly fresh, and the rolls are made with the utmost skill on top of using fresh ingredients. I'd order any regular sushi without hesitation, but if you really want something fun and delicious be sure and try their rotation special rolls. One of the best sushi places in SOC! The Jeff Roll is amazing and Daniel roll! Too many rolls to name but delish! So happy this place is close to home and In Laguna Niguel and Dana Point! The place can be casual and fancy with a very Asian feeling. Dark features inside and clean. No outdoor seating. Super clean bathrooms! Nice service! Fresh food with bold flavors! Bubbly, sweet soda with Japanese soda. I'd come here again. Great Restaurant. Food drink, service, ownership. Great chefs , great people, great crowd. This is - by far - the best sushi restaurant we've ever been to. And we always consider sushi wherever we are. We've never been for lunch, only for dinner. The sushi chefs, especially the more experienced ones, are real artists. So creative. The way they manage to decorate your plate and put flavors together, you are in heaven. Another one of their forte's is doing all that with brown rice. Not many sushi places serve brown rice, and if they do, it's often overwhelming. The Dana Kai chefs succeeded in cooking it to perfection, so their brown rice just ads a balance, a base, to show off the delicate fish even better. Since we started eating sushi there, several years ago, other sushi places can't seem to get it right any more with their white rice. Always a winner. Dana Kai is a go-to lunch spot. The lunch specials are great, the rolls are good and the price is reasonable. You can't go wrong here. My daughter and I came here for lunch and the lunch specials were super reasonable and every detail was spot on. Clean and fast, friendly service. My daughter ordered the $13.99 lunch special and got a ton of food. I ordered the Tuna sashimi and the crunch roll and they were perfect. Beautifully presented and fresh and delicious. Love this place. Will come again. ok folks you know that thing where you eat with your eyes? My girlfriend and I love right around the corner from this place and we love it. The restaurant is full of welcoming staff and they serve you QUICK! You will not need to search for a server because they get to you in a hurry. I would strongly recommend the mountain roll. All of their rolls are really delicious though and frequently they will offer some edamame on the house. If you are looking for a sake bomb, you can get one but you have to buy a miniature carafe of sake and individually order the beers. The effect is the same just a little less straight forward. They have many specials to choose from and the classics as well. They are somewhat pricy but I would say fairly comparable to any other true sushi restaurant. Best sushi restaurant in the area. Great food and service. The owners are always so nice and welcoming. Favorite rolls are Daniels Special and Jeff's Special. The fish is really fresh and the chefs are great at just whipping up a surprise. This spot is one of the best sushi restaurants in South OC. Their fish is always fresh, the rolls are well thought out and taste fantastic, and their service is wonderful. Love the Dana Kai yellowtail roll and albacore carpaccio.